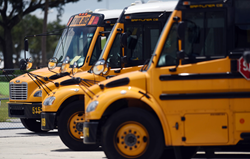 School districts across the country are shifting their bus fleets from diesel fuel to propane autogas to stretch strained budgets and promote cleaner air. CleanFUEL USA today announced that Cook-Illinois Corporation, the largest family owned and operated school bus contractor in the United States and the sixth largest among all school bus companies nationwide, is quadrupling its current fleet of propane autogas school buses for next year and, for the first time ever, has not purchased any diesel buses. Its most recent order includes 50 Saf-T-Liner C2 units from Thomas Built Buses equipped with CleanFUEL USA Liquid Propane Injection (LPI) systems. School districts across the country are shifting their bus fleets from diesel fuel to propane autogas to stretch strained budgets and promote cleaner air. Roger Bannerman, fleet director for Cook-Illinois Corporation, is leading the trend and experiencing significant ROI. In addition to saving time and money on maintenance costs and excellent cold-weather starting, the low-cost of fuel and infrastructure greatly influenced Cook-Illinois’ decision to expand its propane autogas bus fleet. “Paying $1.29 for propane autogas and the ease of setting up infrastructure on-site convinced us to switch,” said Bannerman. CleanFUEL USA, the nation’s first developer of liquid propane fuel injection systems, is a leading manufacturer of propane autogas dispensers and refueling infrastructure. Headquartered in Georgetown, Texas, with an engineering division in Wixom, Mich., CleanFUEL USA celebrates more than 20 years of innovation. Setting industry standards with a complete alternative fuel solution, CleanFUEL USA products offer unsurpassed economic and environmental advantages. Learn more at http://www.cleanfuelusa.com. Connect on Twitter (@CleanFUELUSA), Facebook (facebook.com/CleanFUELUSA), YouTube (youtube.com/CleanFuelUSA1) and LinkedIn (linkedin.com/company/cleanfuel-usa).